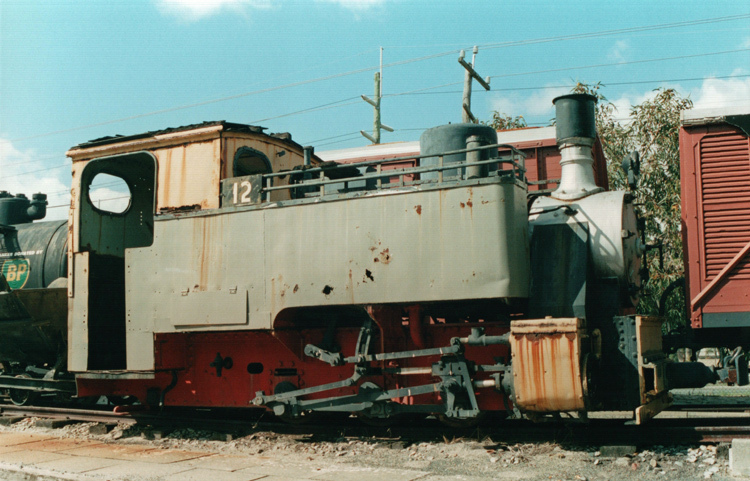 Orenstein & Koppel B/N 4242 displayed at Bassendean on 9 May 2002. The ‘safety yellow’ livery was rather faded at this time, but the loco has since received a thorough rejuvenation and repainting by ARHS volunteers. The Lake View & Star Gold Mines Pty Ltd operated a one-mile tramway for transporting gold ore from Hannans Star Shaft to the Lake View Mill, using two 0-6-0T locomotives supplied by Orenstein & Koppel in 1910 (builder's numbers 4241 & 4242). These two locomotives were reduced to standby usage around 1938 following the arrival of two Planet oil engine locomotives. Both of the Orenstein & Koppel steam locos found later use by the Great Boulder Gold Mines. Orenstein & Koppel B/No. 4242 was out of service by 1960. It was donated to the Australian Railway Historical Society (ARHS) WA Division and placed on display at their excellent railway museum in the Perth suburb of Bassendean, where it is displayed in Lake View & Star Gold Mines livery of safety yellow with back lining. The builder's plate is displayed in the small exhibits hall at Bassendean. UPDATE: In January 2019, ARHS volunteers completed the static restoration and repainting of Orenstein & Koppel B/N 4242, including repairs to the side tanks (which were becoming rather holey!) Resplendent in new ‘Safety yellow’ livery, the loco has been craned into position in a new display location within the museum grounds, together with a side-tipping hopper wagon. For those interested in Orenstein & Koppel, here is a listing of Preserved Orenstein & Koppel Steam Locomotives. published 1983 by Railmac Publications, Elizabeth SA. Compiled by D. Whiteford, C. De Bruin, L. Watson & N. Watson.